We’d love your help. Let us know what’s wrong with this preview of A Neglected Grace by Jason Helopoulos. To ask other readers questions about A Neglected Grace, please sign up. Great little book on family devotions. Family worship should include singing, Scripture reading, and prayer. Provided historical perspective, anecdotes, and practical tips. "As we approach the subject of family worship it is helpful to be reminded that it is nothing more than our response in the home to God's magnificent and infinite grace. And it is by that grace that we gather together with our family members to delight in His excellent goodness and eternal glory. Family worship is not something we have to do. Our right standing before God is not impacted by whether we lead our families in worship or not. Christ has already accomplished all for our salvation. Rather, family worship, like other spiritual disciplines, becomes something we want to do." Jason calls family worship a "joyful responsibility", and I wholeheartedly agree with him. Too often, those of us who actually practice family worship, treat it like it is another box we need to check off on our Christian to-do list, rather than viewing it as a wonderful privilege to share the love of Christ with our other family members on a daily basis and watch the Spirit move in all of our lives. This is especially true for us who have loved ones in our family who are currently not born-again believers...sharing the love of Christ by sitting together as a family and discussing the things of Christ, reading the Word systematically from the beginning of a book to the end of that book, memorizing Scripture together, and then praying over what was read/other areas of concern in our lives is a way for us to glorify God. Consistent, and God-glorifying family worship, is one of the best ways for us to proclaim the excellency of the gracious and merciful God who redeemed us through the precious blood of His Son. We can hang every manner of Joshua 24:15 plaque/banner that we want to in our homes, but nothing "screams louder" that our house truly serves the Lord than consistent and genuine family worship that doesn't incur guilt because they don't practice family worship as often as they want to but a family who practices worship together because they want to and don't turn it into a form of legalism. This is definitely not a long book, and Jason even acknowledges at the outset of his book that this is not an exhaustive book about family worship, but I think it fully accomplishes what Jason intended it to accomplish and that is a book that gently encourages those who are discouraged in family worship to stay faithful, to those who aren't practicing family worship to "just do it", and offers those who are thinking about doing it sample ways to do it. I have already given one copy of this book to someone in my church and will fully recommend it to others going forward. Short, solid, presentation of the need for family worship in Christian homes, and what family worship can look like. I read through this book in just a couple of hours, and was left greatly encouraged to incorporate much of what I read into my own home. This is a good little book that introduces and describes family worship, a neglected grace. It's brief and accessible an provides some encouragement and tools to practice family worship but is also realistic and full of grace for us stumbling and bumbling our ways through. Chapter two contains a strong admonition to fathers. The author does a good job of discussing the responsibility of the husband/father to not only care for the physical needs of the family but also the spiritual needs (cp. 1 Tim. 5:8). Good practical book on the importance of family worship. Some helpful appendices at the end. The idea of family worship for some may conjure up images of the days of the Puritans or perhaps even the days of Little House on the Prairie. In an age where most families activities are centered on work, school, after-school pursuits with worship and Bible study often restricted to Sunday mornings, the idea of carving out time for consistent family worship and Bible study might seem impossible. Jason Helopoulos, in his book A Neglected Grace: Family Worship in the Christian Home, provides the The idea of family worship for some may conjure up images of the days of the Puritans or perhaps even the days of Little House on the Prairie. In an age where most families activities are centered on work, school, after-school pursuits with worship and Bible study often restricted to Sunday mornings, the idea of carving out time for consistent family worship and Bible study might seem impossible. Jason Helopoulos, in his book A Neglected Grace: Family Worship in the Christian Home, provides the reader with a biblically centric and practical guide for families to instituted what God commands, namely the necessity to build families on the foundation of Scripture and glorifying God. As a fan of the Puritans, I was immediately excited to read what Helopoulos had to say in his book and I will state right off the bat, I was not disappointed one iota. In the tradition of the Puritan authors, Helopoulos provides not only the biblical mandate for instituting family worship, he also provides numerous practical ways for families of all shape, sizes, age ranges, and levels of busyness to establish this important element in their homes. Helopoulos readily admits that family worship is not easy and can at times seem rigorous and forced. In response to that perception, he notes “leading our families in worship is a responsibility that is given to us.” Commands in Scripture such as Deuteronomy 6:6-7 states “These words, which I am commanding you today, shall be on your heart. You shall teach them diligently to your sons and shall talk of them when you sit in your house and when you walk by the way and when you lie down and when you rise up.” The words spoken of in that passage refer to Scripture. Furthermore, worshiping God by engaging His word and singing praises to His name should bring us unending joy. I really appreciated the encouragement of Helopoulos for families to sing songs of praise together using hymns, praise songs or even responsive readings. Singing as a family, especially for those tonally challenged, might seem embarrassing at first, however, all God requests is a joyful noise which at first may be all that comes from your mouth. Regardless of how well one might sing, singing praise to God is a vital part of family worship and for my family, I think it will be awkward at first but well worth the effort. Additionally, the emphasis on interacting with the ancient creedal statements and catechisms was also greatly appreciated. Far too many people view these statements of the faith as the area of the scholar, something Helopoulos rightly rejects. In fact, he provides in the appendix section of this book, numerous resources to include the Apostle’s Creed and the Nicene Creed. These important creedal statements of faith combined with the Westminster Confession of Faith and the Heidelberg Catechism, are historical statements of faith that can become a vital part of family worship. A Neglected Grace is a truly valuable shot in the arm for families to engage worshiping God together as a family unit, something Scripture actually commands us to do. The timeless truths discussed by Helopoulos are vital to the health of the overall family unit. As the head of my household, I was excited to read this book and what Helopoulos has to share has encouraged, invigorated, and spurred me to institute family worship as a daily element of my family’s relationship with God. I highly recommend this book for those desiring to grow together as a family in the fear and admonition of the Lord as well as for those wanting to discover ways to train up their children in the way they should go so when they are older, they will not so quickly depart from the ways of God. Instituting a family tradition such as family worship will benefit not just your immediate family unit, it will also benefit generations to come. I received this for free from Christian Focus Publications via Cross Focused Reviews for this review. I was not required to write a positive review. The opinions I have expressed are my own. I am disclosing this in accordance with the Federal Trade Commission's 16 CFR, Part 255 : "Guides Concerning the Use of Endorsements and Testimonials in Advertising." Practically, it is a good read. It starts off with the reasoning behind family worship and ends with how-to and how not-to and a grace-based mention that no one will do this perfectly. While acknowledging single mothers, the author puts such a heavy emphasis on male leadership that I nearly gave up reading. I'm glad I finished, though, because he does give helpful information. I also appreciated the reminder that "it is never a failure to run to God." pg103. A very encouraging and helpful book about leading one's family in worship at home. This was a really solid case for and practical introduction to the largely lost practice of family worship. I appreciated the author's focus on family worship as a gracious gift God has given to Christian families and the church, a "means of grace", rather than another duty to heap upon already busy families which weighs them down. Helopoulos makes a biblical case for family worship, then speaks of the practical benefits and rich spiritual blessings it brings to family life. He goes on to descri This was a really solid case for and practical introduction to the largely lost practice of family worship. I appreciated the author's focus on family worship as a gracious gift God has given to Christian families and the church, a "means of grace", rather than another duty to heap upon already busy families which weighs them down. Helopoulos makes a biblical case for family worship, then speaks of the practical benefits and rich spiritual blessings it brings to family life. He goes on to describe what family worship in the home can look like - mainly Scripture reading with some simple exposition and questions to promote understanding, prayer and singing Psalms, theologically-rich hymns, and God-honouring praise songs (along with some additional and optional elements that some families may want to incorporate). Also valuable is the author's discussion on the tone such times ought to take, calling families to joyful, reverent, regular and consistent worship. The section on what family worship is not is very important and every family seeking to make family worship a practice in their home would do well to keep these cautions in mind and be careful never to let this gracious gift of God degenerate into disciplinarian brow-beating, pet-doctrine soap-boxing, merely moralistic lessons, or an idol in and of itself, where family becomes the focus. Family worship, like private and corporate worship, must be Godward-focused and must never become a tool for parental guilt-tripping or emotional and behavioural manipulation, nor should it ever just become a casual family time which has some loose Christian association or vague biblical orientation. The author includes some good testimonies and stories from families who have made family worship a regular practice, and he also is very pastoral in his approach to encouraging families who are trying to begin this practice in their home. He advises starting slow, small and keeping it simple and short. And when the inevitable days come where it gets missed, rather than feeling like it is a failure, he encourages families to just pick it right back up instead of beating themselves up. It is first and foremost grace after all, which means it is primarily a gift God gives to families, not a duty he demands of them. Yes, family worship is both commanded and exampled in Scripture, but so is Baptism, Communion, corporate worship, and loving your spouse and children, and the commands for these other things are only properly obeyed when they themselves are seen as gracious gifts from the hands of a loving Father, and when we do them out of love and joy, delighting in them, not chafing under them. Such a timely book. Family worship is a topic you rarely hear discussed. Many references to family worship are connected with the word legalism. You can make obedience to just about anything legalistic, but what Jason shows is, far from legalistic, family worship is joyful, grace-filled obedience. He says, “Family worship, like all kinds of worship, is a means of grace and is not to be viewed as a burden or a task to be accomplished” (75). He does this by not browbeating us and by showing how fa Such a timely book. Family worship is a topic you rarely hear discussed. Many references to family worship are connected with the word legalism. You can make obedience to just about anything legalistic, but what Jason shows is, far from legalistic, family worship is joyful, grace-filled obedience. He says, “Family worship, like all kinds of worship, is a means of grace and is not to be viewed as a burden or a task to be accomplished” (75). He does this by not browbeating us and by showing how family worship rooted in the gospel is nothing short of Spirit-empowered joyful gratitude. “Family worship should fix a family’s eyes upon Christ above all else and not upon the sins of one another” (76-77). Amen! The format is straightforward. The first part of the book deals with the why. The second part deals with the how. And he ends with a host of helpful resources. As a firm proponent for family worship, my resolve stiffened and my heart was refreshed. We do not lead our families in worship in vain. Jason quoting Joel Beeke reminds us, “the head of the family in leading his family in covenant faithfulness (family worship) to God is perhaps the most significant way God uses as a means of saving grace” (35). I know I often weary in well-doing, but Jason and Joel remind us God uses even our meager attempts to grow faith in our family for his glory. Anyone who has seriously considered the state of the church and the state of the family in 21st Century America has reasons to be alarmed. A laundry list of problems could certainly be created with a great variety of problems social, moral, theological, and so on. These problems all stem from both an ignorance and lack of faith in the gospel of Jesus Christ and consequently we are not a nation who worships the Triune God of Scripture. If we are to regain our focus in the family and church, then Anyone who has seriously considered the state of the church and the state of the family in 21st Century America has reasons to be alarmed. A laundry list of problems could certainly be created with a great variety of problems social, moral, theological, and so on. These problems all stem from both an ignorance and lack of faith in the gospel of Jesus Christ and consequently we are not a nation who worships the Triune God of Scripture. If we are to regain our focus in the family and church, then we must regain worship once again and appropriate the means of grace that have been provided by God to be means by which the grace of Jesus Christ is communicated to us. Family Worship is, as author Jason Helopoulos writes, a “neglected grace” and that is the subject of this wonderful little book on family worship. 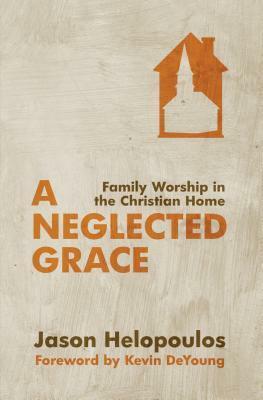 Helopoulos shows the purpose, joys, and practice of family worship in a little over 100 pages. His book is encouraging since it views family worship not as a burden to be endured, but a grace of God to be delighted in and enjoyed with our families. He also addresses the “how-to” questions of what family worship might look like in the Christian home. He is practical and realistic enough to recognize the challenges that face the modern family which seeks to be consistent and regular in this practice. He addresses various challenges such as a lack of time, dealing with young children, practicing family worship as a single parent, and dealing with an unbelieving spouse. He rounds the book out with testimonies from families who practice family worship in different ways providing encouragement from real people. Various appendixes include forms for family worship and suggested books, hymnals, catechisms, creeds, and forms for prayer. I highly recommend this book to all Christian families to read and apply! Thank you to Christian Focus for providing me a review copy! I do not know a more important and practical topic in Western Christianity than the topic of Family Worship. Most of those who have grown up in 20th century America are radically unfamiliar with the idea of the great tradition of an organized time of Family Worship. This is a tragedy that is stunting the spiritual growth of many Christians and, I believe, contributing to the exodus of many young people from the faith of their parents. So, this being said, I was thrilled when I heard of a new boo I do not know a more important and practical topic in Western Christianity than the topic of Family Worship. Most of those who have grown up in 20th century America are radically unfamiliar with the idea of the great tradition of an organized time of Family Worship. This is a tragedy that is stunting the spiritual growth of many Christians and, I believe, contributing to the exodus of many young people from the faith of their parents. So, this being said, I was thrilled when I heard of a new book about family worship by Jason Helopoulos called A Neglected Grace. This book was hailed as extremely grace-filled and Gospel focused. The fact that WTSbooks ran a sale on it for $5 did not hurt my desire to get it and read it. And read it I did. I think it took me just a few hours to read this book. That has little to do with my ability or persisitence and everything to do with the way this book is presented. Short, engaging, practical, challenging and encouraging. Focused on our great God and how He administers grace through our worship as a family, this book is immensely readable. It is also short and does not suffer from redundancies or print simply for the sake of print. The best aspect of this book is that it presents the observance of Family Worship as a means of grace to God's people. The chapters are very practical and offer some pragmatic benefits to engaging in this discipline but, primarily, the benefit of Family Worship is God being honored and glorified by His children being obedient to Him and growing in their love and adoration of Him. A Neglected Grace is a great book. It is quick and precise and wonderful. I cannot reccomend this book highly enough. This short book about family worship has been a great resource for me and my family and my wife and I think about what this needs to look like for our family. This is not something I grew up with. However, Helopoulos makes a great case for why this is so important to our families, to our churches, and to our communities. I'm more convinced than ever that our family worship time is an important part of our daily family life. I also really like the terminology of family worship time. It communicat This short book about family worship has been a great resource for me and my family and my wife and I think about what this needs to look like for our family. This is not something I grew up with. However, Helopoulos makes a great case for why this is so important to our families, to our churches, and to our communities. I'm more convinced than ever that our family worship time is an important part of our daily family life. I also really like the terminology of family worship time. It communicates a much deeper meaning than "devotional." It is more than that. It is to be a time of worship together as a family. It was fun to see the things that we have already incorporated into our family worship time. Helopoulos gave great illustrations, great resources, and great examples of things that we haven't been doing that we can do that will help structure this time and help us make this time more meaningful as a family. He does this without guilt or shame. He openly recognizes that failure in this area is a part of it. We won't always do this the best way. Some days will be harder than others. However, God can bless and use this time in our family. He will bless our efforts. We all know that worshipping God corporately in church and privately through our "quite times" and personal prayer are essential aspects of the christian life. But what about family worship? This short little book was a great introduction to recovering and reclaiming the neglected grace of worshipping as a family. Jason Helopoulos does not mince words here, and every chapter gets straight to the point. He tells us that our identity as worshippers is the basis for our worship in the home. He then We all know that worshipping God corporately in church and privately through our "quite times" and personal prayer are essential aspects of the christian life. But what about family worship? This short little book was a great introduction to recovering and reclaiming the neglected grace of worshipping as a family. Jason Helopoulos does not mince words here, and every chapter gets straight to the point. He tells us that our identity as worshippers is the basis for our worship in the home. He then continues to make his case for why it would be good to practice worship in the home. He then lands the plane with some practical tips on how to do it, and the three essential components, Scripture, Prayer, and Singing. The one thing I wanted to see was a more in depth historical look at the christian family. He briefly touched on it in parts, but I would have enjoyed an entire chapter on it. There is one part that I think most readers will skeptical about, and that is the idea of singing as a family. Jaosn does a fantastic job of creating a desire to do this practice, no matter how out of place it may feel in our day and age. I have been personally impacted by families who practice this one, and I pray that one day I can lead my own children in singing praises to the Lord. Get this book if you have a family or ever plan to have a family. So worth it. Family worship in the home must take its place alongside corporate and private worship in the life of every believer. Worshiping is who we are, it is what we were made to do. As a head of a home, I must take this responsibility seriously, knowing that we are encouraged in Scripture to pursue such worship with joy. Helopoulos, a minister in my presbytery seconded to a large RCA congregation in Michigan that will soon leave for the PCA, provides practical motivations as well: family worship centers Family worship in the home must take its place alongside corporate and private worship in the life of every believer. Worshiping is who we are, it is what we were made to do. As a head of a home, I must take this responsibility seriously, knowing that we are encouraged in Scripture to pursue such worship with joy. This is the book that convinced me that I needed to step my game up. I had heard my pastor preach about the importance of family devotions, but I never got around to it. After reading this book, I was certain that we needed more celebration of the Gospel as a family in our home. Nowadays, my wife and I end (pretty much) everyday with a time of prayer, singing and Scripture reading. Hopefully the Lord will bless us with children, and give us the honor of continuing this tradition with them. It ha This is the book that convinced me that I needed to step my game up. I had heard my pastor preach about the importance of family devotions, but I never got around to it. After reading this book, I was certain that we needed more celebration of the Gospel as a family in our home. Nowadays, my wife and I end (pretty much) everyday with a time of prayer, singing and Scripture reading. Hopefully the Lord will bless us with children, and give us the honor of continuing this tradition with them. It has been a wonderful experience. This was a helpful read. I have been wanting to become more intentional and focused with daily family devotions, but I haven't been sure were to start. This short book does a great job of laying out the theology of family worship and how it fits into the larger Christian life. He lays out practical tips for approaching daily family worship. There is a great balance between encouraging families to step up and enter into this practice and also being gracious about how we fall short and often stumb This was a helpful read. I have been wanting to become more intentional and focused with daily family devotions, but I haven't been sure were to start. This short book does a great job of laying out the theology of family worship and how it fits into the larger Christian life. He lays out practical tips for approaching daily family worship. There is a great balance between encouraging families to step up and enter into this practice and also being gracious about how we fall short and often stumble. This book is a great place to begin for those looking to start the practice of doing devotionals together as a family. I highly recommend it. This short read provides Biblical support and practical application for family worship. The author does well to humbly advocate for beginning this practice while responding to many potential arguments against it. I especially appreciate the gentle and consistent reminder that family worship is for our joy! Thankfully the practice of family worship is not advocated as superior to corporate or private worship, but is discussed as dependent upon them. Helopoulos is advocating for a great concept and I think he is right that this is an area that has fallen into neglect among Christian homes. However, the last chapter of the book is called "Just Do It" and honestly the whole book could have been boiled down to those three words. Family worship is a means of grace given by the gracious hand of the Almighty that we cannot afford to neglect. The spiritual benefit of praying as a family, reading the Bible as a family, and singing as a family is incredible. Family worship leads to our hearts being knit together with Christ more than ever. Also, this act of family worship is pleasing to the Father and brings great glory to His name. By all means, read this book and take heed to the applicable teachings within it! This brief, accessible book is full of motivation and encouragement for spouses and parents who want to practice worship in their home, but don't know where or how to start. The tone is friendly and engaging. The emphasis is on simplicity and "returning" over and over to active practice, rather than setting up rigid expectations that are likely to fail. If you want your family worship to be realistic, resilient, and do-able, this is the book for you. A quick, easy read with some good points and practical ideas. I like the fact that he sets high expectations and says that "we too often underestimate our children." In addition to the basic elements of Bible reading, prayer, and singing, he encourages old-fashioned disciplines like learning the catechism. "Catechizing is a lost discipline in the evangelical church today, and we are suffering as a result."